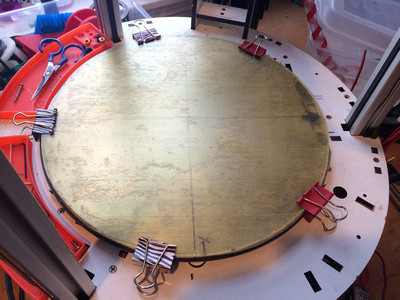 Now that the original PEI print bed surface experiments thread is coming up on a year old and has over 666 and 27 pages of replies, it is getting difficult to wade through to figure out how to do it! So this recap post will summarize things based on my experience. This is the way I do it, there are other ways reported in the thread but that's part of why it became difficult to find things there. What I can say is this: this method works, it has been proven for nearly a year by me and many others, and is not overly difficult or expensive to do. PLEASE DO NOT USE THIS STICKY THREAD FOR CONTINUED DISCUSSION, use the original thread linked above. I will remove superfluous posts from this sticky. 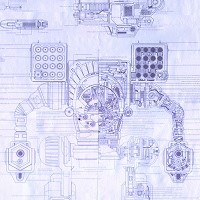 If you have something you'd like me to consider adding or modifying in this post, please post it in the original thread, I'll find it. You can find full resolution versions of the photos here. The 0.03" to 0.04" thick PEI sheet in a 12" x 12" square (for a Rostock or Orion) is the best material to use. It is thick enough to last and not so thick as to be overly expensive. It transmits heat well enough too. You can get it from Amazon or McMaster Carr. I've used both (the McMaster PEI is 0.04" and works just fine). Note that the McMaster Carr PEI is glossy on both sides, the Amazon material is glossy on one side and matte on the other (see A Few Notes section below for more info). EDIT/NOTE: Amazon lists their PEI as "off white" - well it is actually amber, so I suppose that is "off white"! When you are evaluating PEI look for "Ultem 1000" - that is the specific polymer that I know works and is what I linked on Amazon and McMaster's sites. 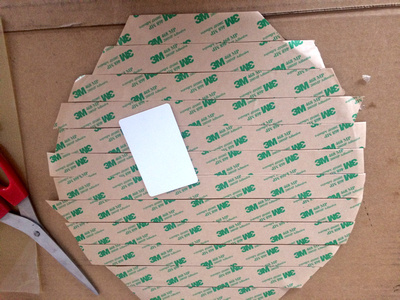 To adhere the PEI to your borosilicate or aluminum plate, 3M 468MP tape is tried and true. Amazon carries it in all widths of tapes to sheets. They all work and each has its pros and cons for attaching. 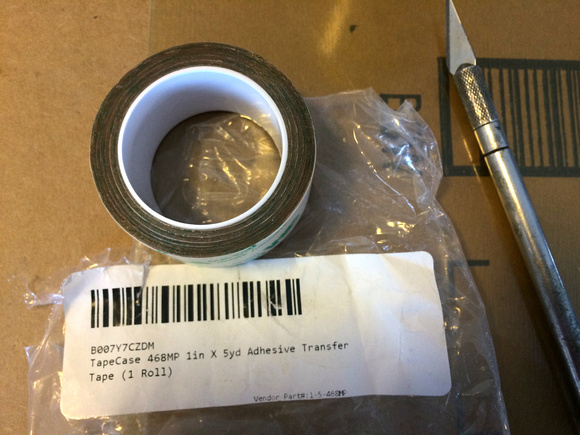 The narrow tapes (I use 1”) require multiple strips but are easy to apply. 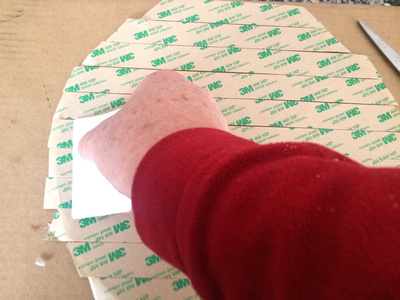 Gaps between the tape strips do not matter but do not overlap the strips as that will cause a lump. The sheets go on in one piece and if you are careful, you can get it onto the glass without wrinkles or bubbles. The #1 requirement is to make sure the surface you are attaching to is absolutely clean. 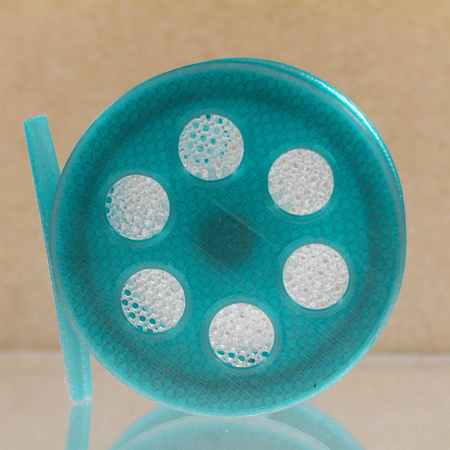 I attach to one side of a borosilicate glass plate. I clean with soap and water and then a final rinse with isopropyl alcohol to remove all traces of grease and moisture. Once clean, do not touch the surface! I'm installing a second piece of PEI on the backside of my build plate. The front side is glossy, this backside will be matte. Note that I drew an alignment arrow with a Sharpie. I always point this at my Z tower so I know my plate will be oriented the same overtime I put it on. Next apply your tape to the glass. I lay down strips starting at the middle and working out on one side and then the other. The tape has a paper film on one side, leave that attached until all strips are installed. Try to keep the tape smooth and wrinkle free. 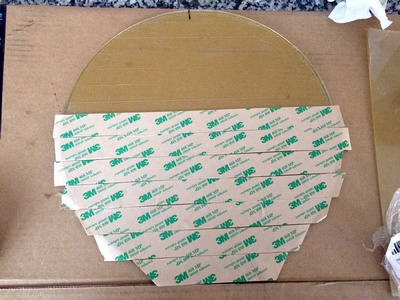 Do not overlap the edges of the tape as that will create a lump in the PEI. Even a 1/16" (1mm) gap between tape strips is not a problem, the sheet will adhere just fine. Trim the tape about 1/4" past the edge of your plate. Once all the tape is applied, I like to burnish it down with a soft plastic scraper. An old credit card works fine too. The idea is to smooth out as many bubbles as possible. Finally, use a hobby knife to trim the tape as close to the glass edge as you can. This eliminates clumps at the perimeter later when you apply the PEI. Now you can clean your PEI. Note that the PEI has two different surface finishes. They both work well and give different results. The glossy side leaves a high gloss on the print. The matte side gives a nice matte finish. The matte side is more forgiving, can be sanded to rejuvenate and I prefer it for my prints. I do have one plate of each though. Clean the PEI exactly like you cleaned the glass and make sure it is dry. You want to do the final assembly in a clean area with no dust or dirt that might contaminate the tape. I use a clean kitchen countertop. You want to do the following step in one smooth and relatively quick motion. Peal all the paper backings from the tape strips with the plate laying on the table tape side up. Then, position the PEI over the plate/tape in the position you want it. DO NOT LET THE PEI TOUCH THE TAPE YET. Make sure the PEI finish (matte or glossy) you want is facing up. You want to install the PEI starting at and edge and work to the other side. On a circular plate like the Rostock or Orion this is tricky since the edge is curved. But you will figure it out - do a couple of dry runs before installing the tape to practice. Now touch the PEI to the edge tape, I like to leave about 1/8" extend over the edge, and slowly work it to the other edge. I bow the PEI into a curve so it sort of unrolls as you lay it down. You will be installing a square piece of PEI on a round bed, that's fine, we'll trim the sheet later. Once the PEI is installed, I like to use a soft plastic applicator or credit card to smooth the PEI into the tape to get it to stick well. Be careful not to put too much pressure or you might break the glass. Most likely you will see a lot of little pockets or bubbles under the PEI. Not to worry, they have no effect on the print surface. I trim the excess PEI on a band saw but you can also score and snap it off in sections with a final sanding to smooth it all out. 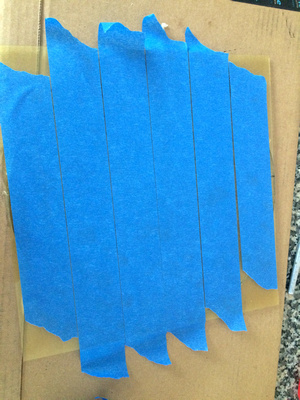 On the bandsaw, I put blue painters tape on the PEI to prevent scratches. I cut 1/16" close to the glass with the taped PEI side down. 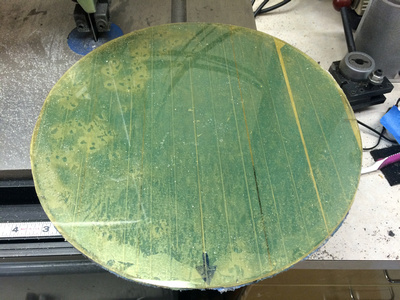 Once the circle is cut, I sand the PEI edge with 400 grit wet/dry sandpaper to smooth it out. 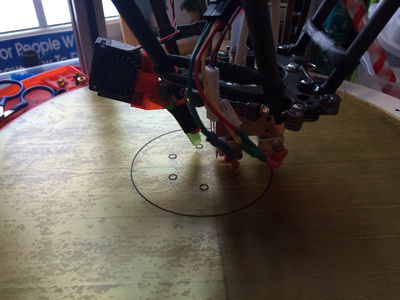 Remove the protective tape, clean the surface with isopropyl alcohol and you are ready to print. 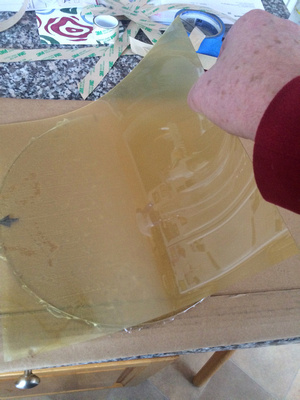 I’ve tested the tape up to 150°C on the hotbed. Please do not try this, I have a special setup and you WILL fry an Onyx at that temp. There was absolutely no problem for the tape adhesion at this temp. So it is more than capable of handling our application. If you don’t use sharp tools to remove parts, PEI can last basically indefinitely. I have two plates, one matte and one glossy. I LOVE the matte and it does stick better for persnickety parts. You can sand the matte side lightly with 1500 grit sandpaper to rejuvenate it if necessary. 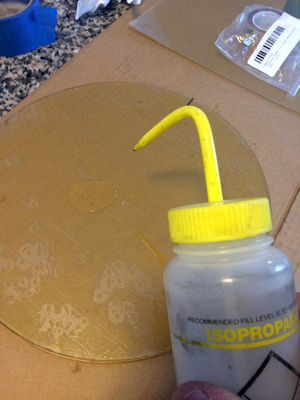 I do this every dozen prints or so, followed with an isopropyl wipe. The glossy side needs to be clean, you can't sand it or you will lose the gloss. I've found that a clean white t-shirt with isopropyl alcohol works best. I rub the plate vigorously. I've wondered if the burnishing action activates the surface in some way but haven't had time to test this. I have noticed that when when the glossy side acts persnickety, a burnish rub will bring it back. You can remove the PEI from the 3M tape and reuse the other side. It is very difficult to remove the PEI but if you start at an edge and bend it up, you should be able to remove it. Then clean the tape side and reapply as above. Firstly, PEI is not a silver bullet. It is just as important to get your Z height dead on and have a well calibrated machine (see the Start Here link in my signature). 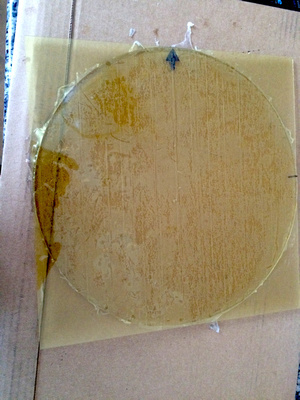 If anything, too thin of a first layer will bond so well to the PEI that removal will be extremely difficult. Not a good problem. For most parts, I simply grab the part and gently pry it up by applying pressure to one edge immediately after the print is finished. Be careful if the part is still warm and soft. 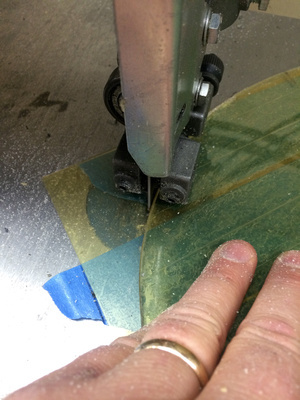 Once you have an edge separated from the PEI, the part will peal/pop off. The trick is to get that first edge lifted. For persnickety parts, let the plate completely cool and pop them off or, if really persnickety, put the plate and part in the freezer. That will ALWAYS work. I'm too impatient for that so I use a can of electronics freeze spray. You don't have to chill the entire part, simply aim at an edge attached to the PEI and squirt. Do not use sharp tools to remove parts, you can/will gouge the PEI. The divot will forever be seen on the bottom of future parts. I have attempted to fix divots with epoxy and that works pretty well but ultimately fails and needs to be replaced. How to fix scratches and divots! You've been using PEI for 100s of prints. You love it. Then you get the inevitable divot from removing a part in your haste. Or you scratch the surface with a poorly set Z height. Never fear, a fix is here! Yes there is a reason. The catalysts generate a lot more heat and result in pull out on curing and as you observed, a harder product that chips out easily. Slow and steady gets the worm in this case. Just thought I'd mention .03" PEI plate is back in stock at Amazon. Mine should arrive Monday! Just switched to PEI, first print in progress, so far awesome adhesion, thanks for the tutorial! What would happen if I were to just obtain a piece of 1/8" or 1/4" thick PEI and lay it on top of the Onyx or the Glass plate and attach it with the same binder clips? Would that not work? 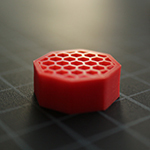 Granted, it costs a bunch more for thicker PEI, but it would be worth it to me because the PEI surface would not be permanent and I could move it between printers, etc. Folks have done that. PEI is an insulator so you would have to wait a long time for the surface to come up to temperature. I'm still skeptical on the "flatness" of PEI simply clipped to the bed. If you are moving from Rostock to Rostock what difference would it make - just move the entire glass plate from one machine to another. With PEI on 1 side, you can also flip the plate around if you want to temporarily print on tape, glue or what ever too. I'd like to chime in, as I'm one who has used 1/8" without adhesive. There is no noticeable increase in heat-up time. With a sufficient power supply and insulation under the bed, the heat up times are FAR better than a stock rostock max. The flatness of the sheet after being clamped is better than the flatness of the toolpath (on a rostock max). I don't have a surface plate to measure against, but the sheet is as flat as it needs to be. I would say that it is at least as flat, if not flatter, than a thin sheet glued to glass. In my opinion, there is absolutely no point in adhering a thin sheet to glass. It seems like a pain to deal with. The adhesive sheets are almost the same as the price difference for the thicker sheet. Also, there are advantages to using the thick sheet. If a part becomes really hard to remove, to avoid damaging the part by using a paint scraper or something to chisel at it, you can simply remove the PEI, and flex it slightly to pop the print off. I've never had to to this, but it's nice to have that option if need be. I've used PEI with the 12 inch square. I suggest the windex method. I adhered mine to an AL plate that I machined to sufficient flatness (I do have access to surface plates) There are some small bubbles from my application, as I did it without windex, as well as some interesting wrinkles from me leaving the heat gun I use to warm the plate up initially in one spot too long. Bot, I'm going to give it a try. Thanks for pushing the envelope on this. $60 for a 12x12x1/8 at Amazon. Is there a lower priced source? .03" 12x12 is $16 and a 6 pack of 12x12 468M tape is $16. That's quite a bit less than $60 and you have 5 sheets of tape to experiment with, use on other printers or sell. I'm still going to try the 1/8" but it is not close in price to a thin sheet with tape. Right, I forgot that the tape includes multiple sheets. I do agree that you can save some money with the thin sheet, but it seems like an insignificant amount of money to me. Maybe I just don't value money as much as I should. 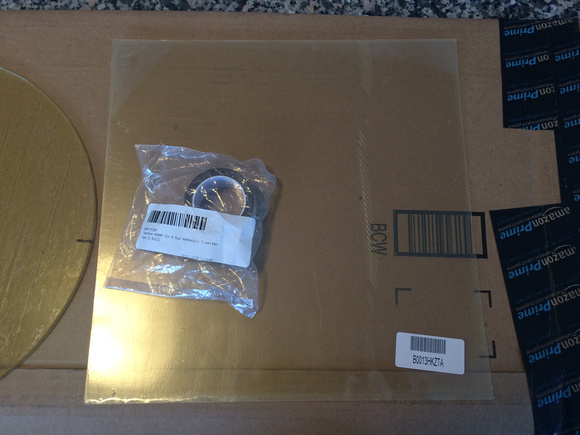 I do order from Amazon, their ultem 1000 12"x12". The sheets I've got have been consistently bowed but lay flat well with binder clips or other methods. mhackney wrote: Bot, I'm going to give it a try. Thanks for pushing the envelope on this. I used these, works very well. The 12x12 is really more like 11.75", and edge on mine was badly chipped, leaving about 11.6 usable in one direction. Not an issue since build area is smaller. Nice to have a bunch of extra sticky sheet for other sticking. 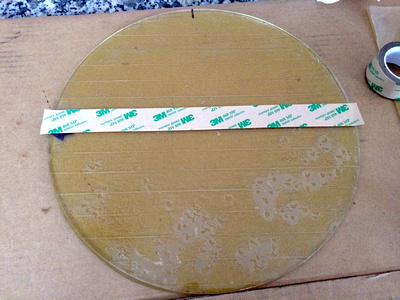 Is there a reason everyone is using double sided sticky tape to mount their PEI substrate? I was just wondering why nobody has used a spray adhesive like 3M or Scotch. It seems like it would be a lot easier than the tape. Yes there is. You would have to search the forums and read buy early experiments with a variety of adhesives. None of them work, they all pealed eventually. The 3M tape (it is not standard double sided tape!) works well, affordable and easy to find. Michael long time no talk haha.. anyway, i am finding more and more (after re ordering this adhesive 5-6 times) that i can not reliably get it off the sheet, or the tape (1") without massive bubbling or globbing. it always happens, without fail. Is there any tips you use? I can usually get a sheet to peel ok, but the tape, ALWAYS happens to screw up for me. freeze it? heat it? I love PEI and im about to put some on a 16x16" bed (i cant find a single piece anywhere that big, unless you can help there?) and need to make sure i can get a clean bubble free adhesion. The aliexpress link i gave in the other thread does do custom sizes. I do not have enough time on my pei to vouch for the quality but it looks good. Search for pei, the contact person had a funny name. Like motzart leo. dunginhawk wrote: Michael long time no talk haha.. anyway, i am finding more and more (after re ordering this adhesive 5-6 times) that i can not reliably get it off the sheet, or the tape (1") without massive bubbling or globbing. it always happens, without fail. I have bought sheets, and it was also very difficult to remove the protective paper without messing with the adhesive layer, as it is very flexible and fragile. In the end, I cut the sheet in bands, in order to be able to cut off the failed parts, and I applied it like it was tape. You have to peel it very slowly. Thanks for the update, the other one is getting large but still contains valuable info so I hope that you are not thinking about deleting it. Last edited by Eaglezsoar on Tue Apr 12, 2016 6:55 pm, edited 1 time in total. The only problem I've had with the tape is getting a roll that the side had been smooshed. I use an XActo knife to lift the backing from the tape to get it started. I agree that the sheets are easier to deal with and that's all I use now. It would be nirvana if someone made PEI surfaces with the adhesive pre-applied!